I suppose we're all more or less familiar with the main stamp printing processes, such as (photo) gravure, lithography, letterpress/typography, embossing and intaglio/recess-printing. And with a bit of luck we're also vaguely able to explain them an' all. 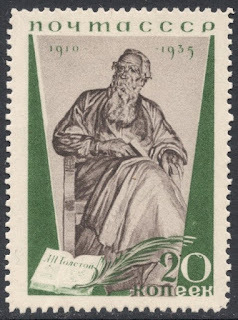 After all, virtually all stamps are printed in one of those processes, so we see them constantly crop up in catalogues, displays, and what have you. That's why I was so surprised to suddenly come across a printing process I had absolutely never heard of before. Last month our local society's meeting fell on the 11th, so we decided to have a members' night and have "War and Peace" as its central theme. It was a great success with over 30 members present (which is about 90% of our total membership!) and some 15 members displaying. I had a frame full of war-themed stamps (including the War Tax stamps I showed last week), a frame full of peace-themed stamps, and a single sheet to link the two. 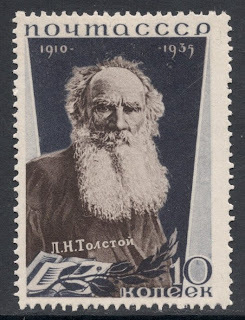 That single sheet was of course based on the famous book War and Peace, written by Leo Tolstoy. 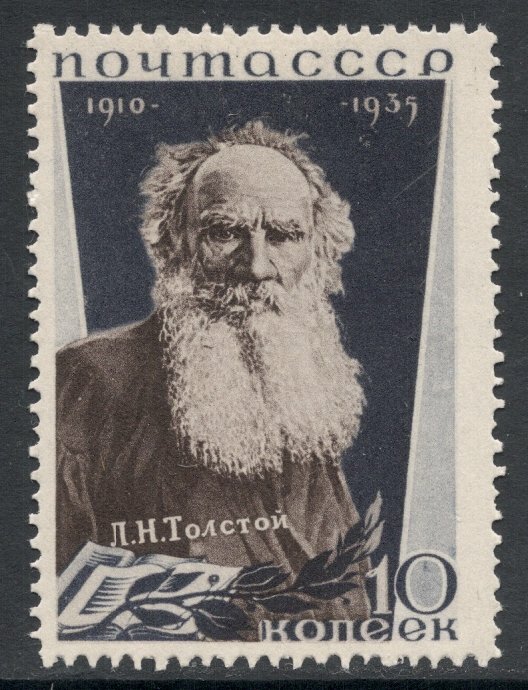 I managed to find enough Tolstoy stamps to nicely fill the page, and central to that page was the 1935 set from Russia, issued to mark the 25th death anniversary of the author. And that's where I came across it, for the printing process mentioned in the catalogue was: collotyped. Ever heard of that? Well, I hadn't. I had to look it up but my limited technical brain clonked out rather immediately, so what I'll do is just refer you to the page where it is explained! If I'm correct it is another form of photogravure, but what exactly the difference is, is not clear to me. Maybe somebody can explain it to me in plain English! If I'm not mistaken, the first time the process was used for Russian stamps was in 1931, for one value in the Airship Construction Fund set. After that, most 1930s issues were printed with this method. In the 1940s, both photogravure and collotype are used for different issues, so there must have been enough of a difference to choose the one method rather than the other for specific issues. The method seems to disappear from the catalogue pages in the early 1960s. 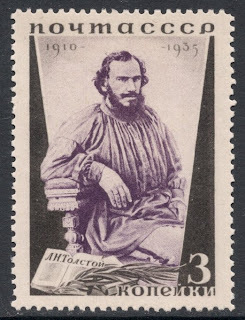 According to Stampboards, the process was also used for 1912 Russian Zemstvos (Poltava) and even for the 1950 London International Stamp Exhibition souvenir sheet. It's all rather intriguing, I think, so if there's any Russia experts around, I'd be interested to hear more about this process and why/when it was used! Hi Dorothy! Survived the Scotstorm?! I checked the catalogue but it definitely says Collotyped, on dozens of pages, so it won't be a typo, I don't think. From what little I remember of a tour of Fox Talbot's house, Lacock Abbey, calotype was used only as an early photographic technique. this printing method is NOT collotype but Phototype or Lichtdruk [in Dutch] or gelatine print. I will find out some more for you. it was first used in 1908 in Budapest for Bulgarian stamps! 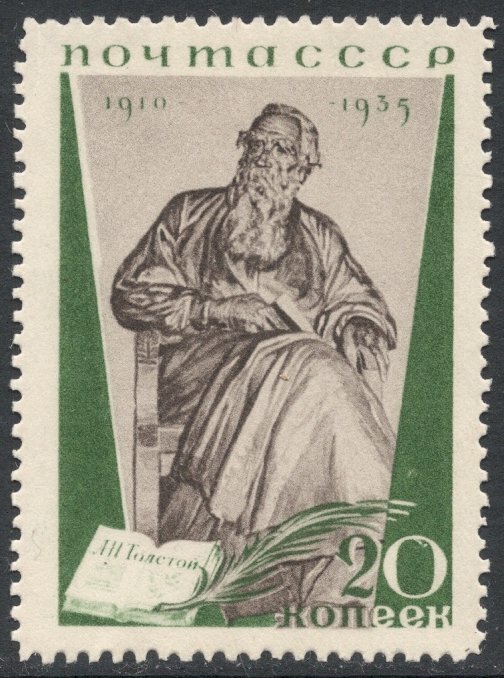 In the 1930-1960 period for quite some stamps of the USSR! Rein, thanks for that! Like Lichtdruck in the Michel catalogues, then. Found the Bulgarian stamps (it was even as early as 1907! ), which are described as being printed in typo according to SG, although Michel does indeed again mention Lichtdruck, and I presume Michel are the more trustworthy when it comes to European stamps. Look forward to hearing more!